I met up with an old friend after a long time today and it was nothing short of a revelation. There are many things we fail to recognise and observe in a person even after closely spending many hours with them over a long period of time. None of the things that mattered to our juvenile minds and egos back then hold any relevance today. We have both evolved and gracefully blossomed into mature individuals who are tolerant of each other’s likes and preferences. That’s so nice. Moments like these, no matter how far apart, are always special. ???? That feeling is really special! The same happened with me few months ago, when suddenly my “Bestes” friend who vanished like Amir Khan in 3 Idiots called me in the night, and I still couldn’t believe it!!!! Then we met some day, and we were laughing over each other’s face… ???????????????? Haha. You are already having reunion moments. Wow!???? It must be fun meeting your real life Rancho, isn’t it? Did you sing ‘Behti hawa sa tha wo….’ for him? ???? No we didn’t sing that. We were speechless upon seeing each other. We just talked rubbish, I don’t even remember what we talked about. “Do you remember that girl from our class? She lives right next to my home” lol… Such was the conversation, purani baate or school life. That’s so cute! Rancho…new nick name for you now. ???????? I wonder why it is always about that girl or that boy with old friends. We did the same. Old flames…where they are…married…kids and all that stuff. ???? hahaha, old flames and all, I guess we have a habit of running out of important topics and having a handful of rubbish topics to talk about whenever we meet an old friend. P.S. I love the change in your display profile? Who joined you in the “Legfie”? My dear, old flames and all is by far the most discussed and important topic! How can we not talk about the rubbish that bothered us earlier? ???? Legfie…nice word. ???? It is indeed Angel…the ever stylish one. Did you notice how she aped my legfie perfectly? ???? Aww, she is walking in the shoes of her mother. That’s so cute. sometimes I just wonder when she will grow up, if she will read your blog and our conversation about her, lol. He is good. Enjoying holidays by bugging me. ???? Hahahahahaha!!!! I still remember that “Topi”! That was so cute! Yes…topi ???????????????? Cap..hat…I tried to teach her a lot. But topi it is. He did but it took a backseat in front of cricket and cycling. Sigh! May be have to wait some more. I should make him read your blog for inspiration! Cycling has its own *charm* lol… I don’t like cricket, so no comments! That means a lot coming from you Di! Maybe he should read percy jackson and harry potter. I read them too and then wrote as good as I can now. Hmm…I have yet to explore both. Let’s see. I don’t have the patience to even watch sequels. Reading is a different ball game. ???? And yes, when your family is with you in your decision, go ahead and prove everyone wrong. Pcmb gives you flexibility to take whatever you want. ☺???? What are you doing now? Results are still some time away right? I’m studying the syllabus of 11 all by myself right now, yes, they might come in the first weeks of june. Already studying? ???????????? Enjoy baba….have fun. Don’t be so padhaku. I have chosen pcmb Di, so syllabus is increased, but yeah, I’m enjoying!!!! I only study at the night, in the day I write my book and write some posts for my blog. What mould you are made of yaar? I wish I had so much initiative when I was your age. Am so proud of you! ☺???????? I get so happy whenever someone says to “Pcmb, don’t worry. I had the same” I feel so relaxed after much discouragement from my teacher and friends and principal for taking this decision. My family always supports me. I am made up of Panda Mould, though I am not that fluffy and motu, just the opposite, lol. I am so glad you’re proud of me Di! My cute Panda, now have to log off. Have to rise us early tomorrow. Am travelling. Bye for now, dear. Good night! Thanks dear. Btw, I hate cricket too. ???????? 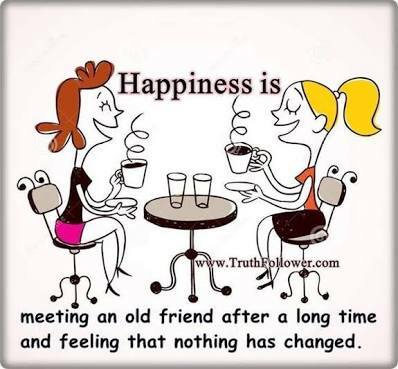 I have friends that I see about twice a year, but whenever we catch up it is as if we have never been apart. ???????? This time in india I met a friend after 20+ years.. we were in same class from 6th to 10th..
Wow! It must be great catching up. ???????????? I had a reunion with my college friends and then separately met this friend who I know since school days. Going down the memory lane was a lot of fun! Next Post Are children's games only games?